Today's the first birthday of my blog and I want to say a big thank you to every person who's read my ramblings and especially if you've taken the time to follow or leave a comment. I really appreciate your support. I thought why not celebrate by posting millions of pictures of myself?! 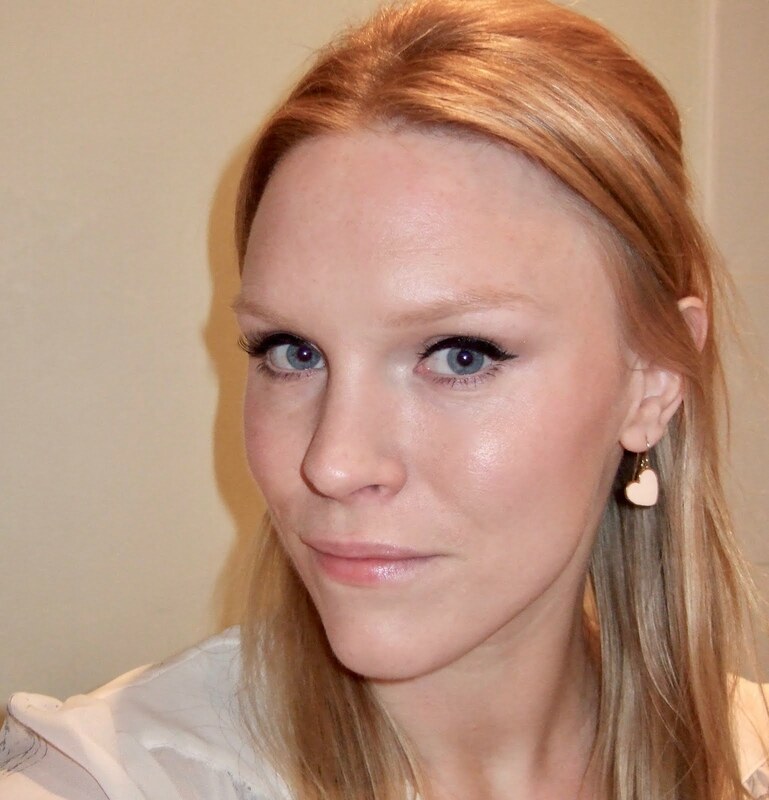 Here are a few makeup looks I've tried out recently. Thoughts? 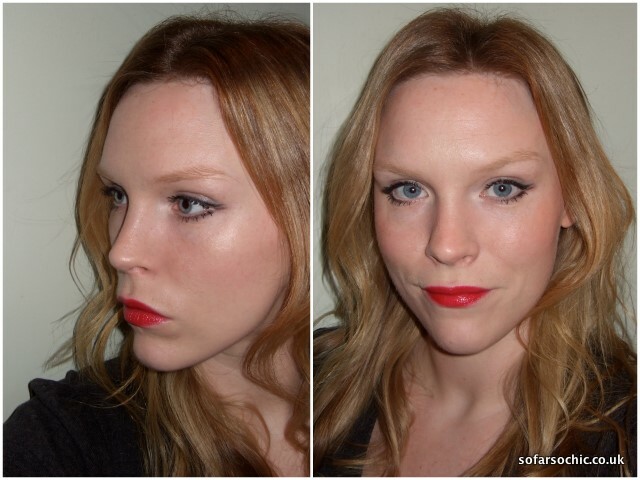 I tried this makeup after seeing a picture of Taylor Swift with bright red lips and double flicks of black eyeliner. The red I used is the same as for my Minnie Mouse makeup! You can see the colour a lot more clearly on that post too. It's an amazing product from Lancome called Laque Fever. The colour is 110. It applies with a wand like a gloss but has the depth of colour of a lipstick. 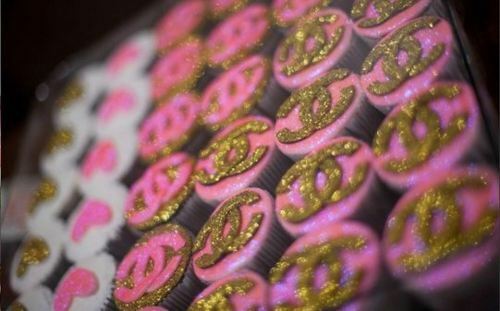 You get beautiful shine and staying power but it does transfer to everything and stain your mouth pink! The colour is perfect for people like me who look revolting in blue-reds. I never wear bright lipstick and it still shocks me to see it on myself! 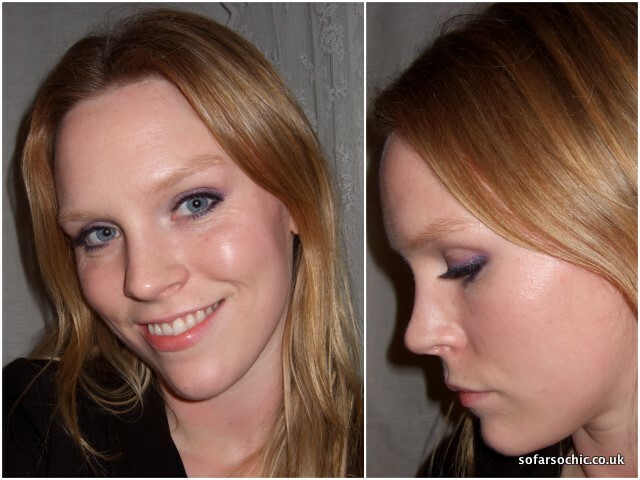 This purple eye was just something I did quickly on New Year's eve. I used the Avon Luxe Lace True Colour Eyeshadow Quad in lace electric. Lovely soft, blendable colours; not as vivid as they look in the pan but buildable. I didn't use any primer and they did fade a bit by the time 2011 rolled around but you can't complain for £4.00! I look as if I'm wearing loads of liner but it's actually some short falsies from Girls with Attitude in 'classic'. Another Savers bargain! I thought it was nice to see a smile for once but what the hell are those wrinkles!? The blog's not the only one getting on a bit. Someone recommend an eye cream, stat! 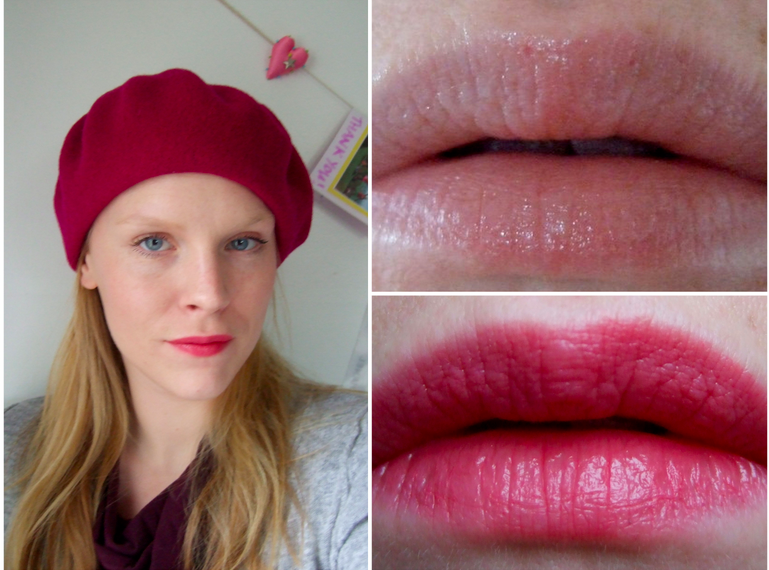 I have loads of different berets and just shoved this one on quickly before going out as I thought it might go with this lipstick. Another Avon product (I'm not sponsored) – Luxe Lace Ultra Colour Rich Lipstick in instant mocha. Dunno why it's called that because it's not remotely brown or coffee-coloured. Conjures images of Rimmel's heather shimmer... Anyway, fantastic colour pay-off, lovely smell, smooth and moisturising. Lasted through a long walk where I probably ground my teeth I was that angry. Think it's a bit too pink for my skin tone but it gave a good 'Snow White' bitten lip effect. Thanks so much for reading, dolls. Here's to another fun year! I think you look absolutely stunning with a bright lip colour - the Lancome red suits your colourings to a T. It looks marvellous! @Doriana Gray -Thanks. Maybe we should try to break out of our comfort zones in 2011? @The Beauty Bite - Thanks girl. You look gorgeous in bright red lips and have the most amazing skin! @The Bristol Beauty Blog Thank you so much. A bit of matchy matchy is fun occasionally I find! @Peonies and lilies - Thank you lovely lady. Your skin is always radiant! @Jan - How fab to see you blogging again! Thank you. Tis all just makeup trickery.